The story of this collection, sprang from a meeting between a free and captivating woman, Marie Tabarly, and a dreamy and creative woman, Anna Beyou, artistic director at 727 Sailbags. From this complicity, which combines Marie's natural elegance and authenticity with Anna's creativity, a number of unique pieces we born, made in the original sails of Pen Duick VI. While Marie is embarking upon a vast project on board the mythical yacht, this collection resonates like an allusion to history and a tribute to Eric Tabarly, her father. 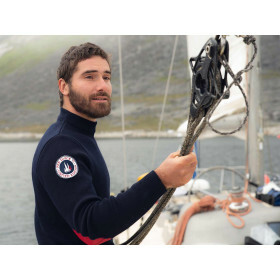 All the pieces are unique, numbered and accompanied by an authenticity label certifying the origin of the sails. Hence, in the Yankee, a headsail, we made three sailcloth bags: two tote bags and a travel bag. From the emblematic T-shirt of Eric Tabarly and his crew, we have created a capsule of clothing, and inserted Spinnaker sail pieces. 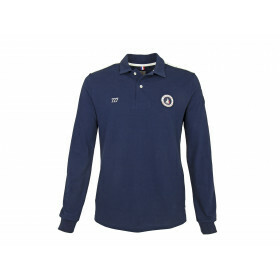 The collection includes a sailor's pullover for men and women, a sweat-shirt, a polo shirt and the collector's T-shirt. About Pen Duick VI: In 1976, Eric Tabarly turned the sailing world upside down by winning the OSTAR Race (English Transat) solo, on board the mythical Pen Duick VI, initially designed for a 14-strong crew. Since July 2018, the illustrious ketch has been put back into service, with Marie Tabarly and her crew at the helm, for an odyssey over 4 years which will sail past the 3 capes: Horn, Good Hope and Leeuwin. This is the trajectory of the Elemen’terre project. At each stopover, Marie receives two guests: one from the cultural world (artist, musician, author), and the other a high-level outdoor sportsman.